"Though we fail, our truths prosper" - John Lilburne. 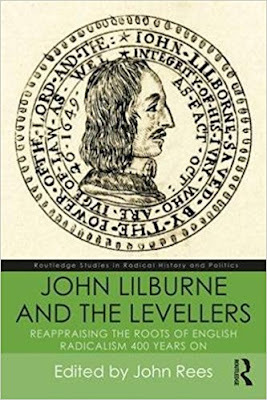 The essays contained in this book are primarily the product of a conference held at Bishopsgate Institute to celebrate the 400th anniversary of the birth of John Lilburne leader of the Leveller Party. The remit of this new book is a daunting one. To reappraise any historical topic or figure is usually a fraught undertaking to do so after 400 years have passed has to be applauded. This article will examine the extent the authors of these essays have achieved this aim. The central thrust of this collection of essays is to establish John Lilburne (1615–1657), or 'Freeborn John' as the central revolutionary figure of the English Revolution. The book also contends that his party the Levellers played a significant part in this glorious revolutionary period. The subjects covered in the book range from an examination of Lilburne’s writings and ideas, the role he played as a lead activist in the revolutionary drama. Personal and political relations with his wife Elizabeth are examined, his exile in the Netherlands, and contentious decision to become a Quaker. If Thomas Carlyle was correct about removing the dead dogs from Cromwell’s reputation the same could be said about Lilburne. Looking back from such a distance it is hard to believe that Lilburne was such a feared figure and was subjected to “sophisticated propaganda campaigns”. Out of all this Lilburne has according to Mike Braddick become the ‘celebrity radical’. On a more serious note, The book is also testimony to the strength and contemporary nature of his ideas. As Edward Vallance points out, it is debatable whether the radicals of the eighteenth century or even nineteenth century would have been so radical without Lilburne laying the foundations for their revolutionary activity. The last decade or so has seen a significant rise in the interest in John Lilburne and his Leveller Party. In the last few years alone there have been four significant studies beginning with Elliot Vernon and P. Baker’s the Agreements of the People, the Levellers, and the Constitutional Crisis of the English Revolution followed by Rachel Foxley’s The Levellers: Radical Political Thought in the English Revolution. John Rees’s The Leveller Revolution. A further examination of the Levellers will be released at the End of October by, Gary S. De Krey Following the Levellers, Volume One, volume two will be released in 2018. All these studies attempt to answer one primary question How radical were the Levellers. This is a contentious issue even today? Out of these studies and I am well aware of generalising too much there appear to be two strands. One takes a more cautious and conservative approach this is represented by the essays contained in Elliot Vernon and P. Baker’s The Agreements of the People, the Levellers, and the Constitutional Crisis of the English Revolution and more radical approach as represented by these essays. The Paper by Elliot Vernon and Phillip Baker called What was the first Agreement of the People tends to argue that the Levellers were far from a cogent group but were, in fact, part of a far more significant political grouping centred on the Independent Alliance. They argue that” the very concept of ‘the Levellers ’, in the sense of a political group which, in Taft’s opinion, existed from mid-1646 ‘as a distinct party with a programme and an organisation to advance it ’, is problematic in itself. As is now well documented, at the level of nomenclature, any talk of ‘the Levellers ’ before the Putney debates is a terminological anachronism, for although the word had been used to describe enclosure rioters earlier in the century, it was not first used as a proper noun until 1 November 1647. Naturally, the absence of a name does not preclude the existence of such a grouping, and a small number of individuals, including Overton and William Walwyn, evidently came together in the mid-1640s through their involvement in a petitioning campaign in support of Lilburne and their common belief in religious toleration. For both Gentles and David Como, the triumvirate of Lilburne, Overton, and Walwyn was sufficiently interconnected by 1645 or 1646 to constitute the leadership of an identifiable group with their own distinctive political agenda. Yet, and in common with Kishlansky, we maintain it remains difficult to distinguish members of this group from the much larger alliance of political and religious Independents, sectaries, and self-styled ‘ well-affected’ Londoners who banded together at the same time through their support for the New Model Army and common hostility to Presbyterianism”. Another question that comes to mind is what accounts for this plethora of studies. Much of the new stuff has started to take on the previous anti Marxist revisionist historiography. The historian Christopher Hill answered this when he was asked in 1992 How do you see the development of the debate around the English Revolution over recent years? Would you agree that the revisionists have taken some ground? He replied “They have made a lot of useful points, but their more extreme views are now being attacked by the younger generation of historians. Although the revisionists had all sorts of useful ideas they had a terribly narrow political approach in that they tried to find the causes of the English Revolution solely in the years 1639–41. This simply assumes what you are setting out to prove. If you look just at those years then, of course, it is a matter of political intrigue and not long-term causes. “I think people are reacting against that now. The better of the revisionists are themselves switching around a bit. John Morrill, for instance, who thought everything depended on the county community and localism, is now taking a much broader point of view. Moreover, Conrad Russell has become aware that long-term factors must be considered – he does not like it, but he recognises that religion has some long-term effects on what happened in 1640, a rather elementary point but he left religion out altogether in the early days. Now he has bought it in. He still leaves out the cultural breakdown in society of that period, but he is moving a bit. I think a consensus will arise and then there will be another explosion in 20 years or so. These debates occur regularly – ever since 1640 people have been arguing about what it was all about”. This analysis is being vindicated today. Also, I believe the attempt in reappraising both Lilburne and the Levellers is a partial reflection of contemporary events. We are after all witnessing social upheavals that have few parallels in history. Maybe the fact that we could be on the brink of a nuclear war between North Korea and America has sharpened a few minds. Again when Hill was asked why he wrote a particular book, he said “there was no direct connection to events going on around him, but he did admit there was no conscious decision to write the book because of the events at the time, but inevitably as I wrote, I was seeing analogies between the 17th century and contemporary events all the time” . The writer John Rees is quickly becoming a leading expert on John Lilburne and the Levellers. Rees acknowledges in this introduction that despite being called Levellers at the Putney Debates of 1647, they were, in fact, a recognisable political entity well before that. It was clear very early on that Lilburne, and his Leveller’s represented a force that went well beyond their class base. Moreover, their propaganda began to reach a broad section of society. You only have to funerals of Levellers that were killed by Royalists such as Thomas Rainborough or Levellers killed by Cromwell to see that the sheer size of these funerals indicates a level of support beyond their class. Lilburne was a member of the gentry. As Rees points out this was a “discontented and volatile group”. Lilburne and his fellow Levellers could have a reasonably comfortable life, but they choose to tackle injustice poverty and a lack of democracy by carrying out political agitation. Rees correctly points out that Lilburne’s ability to reach a broad audience was done not just with his physical bravery and undoubted talent as an agitator but helped enormously by the growth of new technology such as the colossal growth of secret printing. He sums up “How Lilburne’s reputation and the history of the Levellers have come down to us is long, complex and contested. There has never been a moment when it has not interacted with contemporary politics or refracted through modern political debate. In Reborn John? Edward Vallance charts the first of these great transitions as radicals and others in the eighteenth century debated the lineage of the first modern revolutionary leader and the movement he represented”. This essay was not written for the Conference it is in fact, a reprint from 2004. It is quite ironic that as Foxley wrote this essay back in 2004 citizenship rights were being attacked all over the world. Many people were and are still being stripped of their citizenship by governments who have cynically used the Magna Carta to do this. People seeking to defend these rights could do no better than study Lilburne’s struggle to establish them in the 17th Century. As Foxley correctly brings out in her essay, Lilburne had used the Magna Carta to justify extending citizenship rights to a broader section of the population. His battle-cry for democracy was a progressive one in that it sought to eradicate social relations based on Feudal laws and social customs. Nevertheless, the formal rights and freedoms, and constraints on arbitrary power, enunciated in the Charter also contained a universal content. Essentially, they gave early expression to the assertion of the inherent rights of man, however necessarily constrained and formed within the current historical realities and class relations of the early 13th century England. These political rights were the subject of centuries of struggles waged by the masses against the property-owning classes in England, the Continent and, later, America. When Lilburne fought for his and other citizenship rights his ideas were also were constrained and formed within the current historical realities. These realities were not products of his gifted mind but reflected material reality. As Foxley correctly points out that there is no consensus amongst historians as to what Lilburne meant by Citizenship. “Lilburne’s writing emerges out of the context of parliamentarian argument during and after the ﬁrst civil war. There has been a tendency to classify political theories of the early to a mid-seventeenth century in England by asking whether they resulted from historical or theoretical modes of thought”. Alternatively, put another way does social being determine social consciousness. This subjective was taken up by the Russian Marxist Evgeny Pashukanis who pointed out “the contrast between the Levellers and those movements which sought social revolution and attacked the existing property relations was, so to speak, confirmed. However, this was only the case if we are to be satisfied by the consideration of ideological formulae and not the objective meaning of the given revolutionary movement. The ideology of the Levellers was a typical bourgeois ideology, and the overwhelming majority of the Levellers acted as defenders of the principle of private property and this by no means contradicts the fact that the victory of the Levellers’ movement should have objectively led to the most decisive infringement on the right of feudal property. Moreover, this success and this victory could not have found its expression other than in the elimination of feudal ownership. Therefore, when the opponents of the Levellers accused them of attacking property, and of favouring communism, this was not merely slander. It was a statement of uncontested fact that for the privileged feudal owners the radical democratic transformation for which the Levellers strove would have presented a most real threat. The affirmations of the leaders of the Levellers, concerning their adherence to the principle of private property, were a very weak consolation. And, on the contrary, the preaching of the communality of ownership and the clouded communist ideology of the extreme left leaders of the German peasant war, was in fact less of a threat to embryonic capitalist social relationships, but was instead the banner of the implacable, most consistent opponents of feudal ownership and all serf and semi-serf relationships. It is here that it seems possible for us to find a series of elements which bring the two movements closer together even though they are so different in their ideological bases”. Like many of the historians who have contributed essays to this collection, Foxley believes that the Levellers were radical to a degree, but she does not believe they were revolutionary. She tends to separate the ideas developed by the Levellers from their material base in society. Foxley is correct to point out that revisionist historians have not only attacked Marxist conceptions of the Leveller’s ‘The revisionist historians who have rewritten the history of the seventeenth century have questioned almost every aspect of the historical reputation of the Levellers’. How far Foxley intends to go in defence of the Leveller’s is another matter. It is open to question to what extent Foxley herself has adapted to this revisionist assault. One criticism of her is concentration on Leveller political theory to the detriment of their economic and social base. As John Rees correctly points out that this “approach runs the risk of producing the effect that the philosopher Hegel describes as ‘ night in which all cows are black’, meaning that it is impossible to differentiate the object of study from its background. Norah Carlin who wrote the Causes of the English Civil War and has published much on religious toleration during the English revolution correctly states in this chapter that Lilburne was a man of profound principle and unlikely to compromise on the matter of perspective or strategy. “out of the Independent and Separatist congregations of London, there emerged in 1646, under attack from the Presbyterians, a movement for religious toleration. As the Presbyterians organised for their attempted coup in 1647, it became evident that this movement would have to defend civil liberties as well, for one of its leaders, John Lilburne, was thrown into prison for his writings. Moreover, as the soldiers of the New Model Army began to organise spontaneously in their own defence against disbandment, a group of those active in the movement turned to address the army and work among the soldiers for a new constitution that would guarantee both religious and civil liberties. This is the group known to their contemporaries and to history (though they disliked the name themselves) as the Levellers. The amount of irreligion in the English revolution has been contested by numerous historians. Christopher Hill in his pamphlet Irreligion in the Puritan Revolution quoted Richard Baxter who believed that those who rejected mainstream religion were ‘a rable’ “if any would raise an army to extirpate knowledge and religion, the tinkers and sow-gelders and crate-carriers and beggars and bargemen and all the table that cannot read…. Will be the forwardest to come in to such a militia” It is understood Baxter argued for their suppression with violence if necessary. Carlin’s viewpoint and many other aspects of the Leveller’s philosophy has as John Coffey mentions in his paper Puritan and Liberty “fallen on hard times”. Meaning that the sustained attack of the revisionists has won the day. Carlin rejects this premise. Carlin-like Coffey believes that the revisionist historians have deliberately downplayed the extent of religious toleration argued by groups such as the Levellers. Carlin brings out that Leveller views on toleration were not confined to their own organisation but spread to the New Model Army who said “our design is to over throw Presbyterie, or hinder the settlement thereof, and to have the Independent government set up, we doe clearely disclaime, and disavow any such designe; We one∣ly desire that according to the Declarations (promising a provi∣sion for tender consciences) there may some effectuall course be ta∣ken according to the intent thereof; And that such, who, up∣on conscientious grounds, may differ from the established formes, may not (for that) bee debarred from the common Rights, Liberties, or Benefits belonging equally to all, as men and Mem∣bers of the Common wealth, while they live soberly, honestly, and inoffensively towards others, and peaceably and faithfully towards the State”. Carlin’s work on toleration of the various religious groups is a refutation of the current wave of revisionism which seems to reject everything that has been written on the Levellers from a left viewpoint. Carlin has held a relatively consistent position on the Levellers. She perhaps holds the most orthodox Marxist positions on their development and class outlook. Her article Marxism and the English Civil War should be the starting point for any discussion on the English revolution. While not agreeing with every statement she makes her views on the Levellers are worth a read and study. She believes that far from being a radical wing of the Independents she belives the Levellers “broke with Puritan politics and even with Puritan language to develop a secular and democratic perspective. Their main social base was the small independent producer, and their most important achievement was their intervention in the army in 1647, which forced Cromwell and the army officers at least to listen to them for a few months. Their programme, designed to separate political power from wealth, foreshadowed the nineteenth century People’s Charter, and their organisation in the City of London on a ward-by-ward basis – with weekly subscriptions, a central committee, a regular newspaper and door-to-door canvassing – was the seed from which all grassroots organisations were to spring”. Her summation of the Levellers is also significantly different from many contemporary radical historians in that she believes that “It is wrong to see the Levellers as simply the most revolutionary section of the bourgeoisie. Both their social criticism and their political principles were opposed to the continued growth of capitalism. That the reforms they proposed could not have stopped the development of capitalism in practice is another matter. The least that can be said of the Levellers is that they made a long-range social forecast of an era of exploitation, oppression and imperialism, and tried to stop it from happening. In doing so, they left a legacy of organisational and political principle which bore fruit in the development of Chartism and the nineteenth-century working-class movement. They deserve, at the very least, our recognition of their struggles”. This chapter is a long-overdue appreciation of not only Elizabeth Lilburne but other women Levellers. The Leveller women were the backbone of the movement. It is safe to say that the influence of the Levellers would not have been so significant without the political work of female Levellers. Indeed without the intervention of his wife Lilburne himself would have been killed. Studies of the role women during the English revolution both in the past and present have been few and far between. Ann Hughes’s last book Gender and the English Revolution was an attempt to rectify this anomaly. History and for that matter, historians have not been kind to women who took part in political activity on both sides of the English Civil War. There is a dearth of material on women’s struggle at this time. As far as I can ascertain no significant biography exists of two of the most famous Leveller women Katherine Chidley and Elizabeth Lilburne. It is only now that Lucy Hutchinson is now getting serious attention. For the last few hundred years, she has only been known as the wife of Col Hutchinson. While being part of the Leveller movement of the party they were in some respects an independent movement themselves. It is high time that a serious study of the women who took part in the English revolution. After all, as one Leveller petition put it “have we not an equal interest with the men of this Nation, in those liberties and securities contained in the Petition of Right, and the other good laws of the land? Are any of our lives, limbs, liberties or goods to be taken from us more than from men, but by due process of law and conviction of twelve sworn men of the neighbourhood”? If their male counterparts underestimated women Levellers, this was nothing to the treatment they received when they started to carry out political agitation independently. When Women Levellers mounted large-scale demonstrations and organised petitions for social equality, they were met with differing levels of brutality depending on which class they belonged. overall, middle-class women were treated with derision, but mostly no violence was committed against them. It is not the case with the poorer sections of the women’s movement who were often treated severely by MP’s and soldiers alike.” Many were thrown into prison, mental institutions or workhouses. Middle-class women were quietly escorted away by soldiers and told to 'go back to women's work”. While it is difficult to gauge the size of the support for the women Levellers one cannot be blind to the fact that when The Levellers organised petitions, ten thousand Leveller women signed them. Many of these petitions were calling for equality with men. “Since we are assured of our creation in the image of God, and of an interest in Christ equal unto men, as also of a proportionable share in the freedoms of this commonwealth, we cannot but wonder and grieve that we should appear so despicable in your eyes as to be thought unworthy to petition or represent our grievances to this honorable House. Have we not an equal interest with the men of this nation in those liberties and securities contained in the Petition of Right, and other the good laws of the land? Are any of our lives, limbs, liberties, or goods to be taken from us more than from men, but by due process of law and conviction of twelve sworn men of the neighbourhood? Moreover, can you imagine us to be so sottish or stupid as not to perceive, or not to be sensible when daily those strong defences of our peace and welfare are broken down and trod underfoot by force and arbitrary power”? To conclude even the small amount of research needed for this article has uncovered that for historians who like a challenge a detailed study writings of the radical women of the 17th century will in the future provide us with much deeper understanding of the radical Women today who are still struggling for social equality today could do no worse than study the struggles of the women Levellers. Robertson concentrates in this chapter not so much on Lilburne’s political activity but his impact on English law. It is hard not to agree with Ed Valance that “his legal struggles exerted a tangible influence on British law, helping to change legislation relating to libel, the power of juries and even the legal status of slaves on British soil”. It is again ironic that the very democratic rights that Lilburne fought for are coming under sustained attack to today. As Robertson warned “in a country where Parliament is now the sovereign, that any attempt to pass laws that deny to the people the rights which "Freeborn John" extrapolated from the Great Charter – to jury trial, access to justice, free speech and to call government to account – will be struck down by the High Court because they are rights which may now be implied from the Australian Constitution. You cannot have a true democracy without Magna Carta's guarantee of the rule of law”. John Rees points out in this chapter that Lilburne was many things to many people.To say that he was a complex character would not be an overstatement. Rees is correct to call Lilburne a revolutionary leader of a what was a revolutionary movement or party. Rees believes that Lilburne far reacting to events in an empirical way had a strategic sense in that his writings and ideas were a guide to action, not the other way around. Rees’s work in this chapter is an extension of his PhD thesis. Rees has sought to oppose some prevailing views of the Levellers one such attitude is that Levellers had no history before the 1640s. This point has proved most controversial because up and till now there has been little evidence to counter this view. Rees’s also counters some historians who have tried to present Lilburne as a leader of a free collection of radicals. Rees provides extensive evidence to the contrary. While not being a party in the modern sense they nonetheless were a well organised and firmly coherent group. As Rees puts “by 1646, the group ‘both in the eyes of their opponents and in the internal ideological support they deliver to each other, is a functioning collective organisation’. Perhaps Rees’s most salient point in the chapter is at the end when he points out that Lilburne had no revolutionary precedent for his actions. Peacey has written extensively on the secret and not so secret printing world of the Levellers, and it is an area that requires a lot more work to give us an even more precise evaluation of the Levellers and their influence. While ground-breaking is perhaps an overused word in the lexicon of English revolution studies, it is justified in Peacey’s case. In many ways, the study of the printing capabilities of the Levellers holds many secrets to their popularity and their influence. Like many historians in this book Peacey has challenged many of the conceptions held by revisionist historians. Many of these revisionists have sought to downplay not only the radicalism of the Levellers but also influence as Dr David Magliocco points out in his review of Peacey’s Print and Public Politics in the English Revolution. “Historians to have long been fascinated by the mid-century collision of print and revolutionary politics. Thus whilst acknowledging that this field has been ‘hotly contested’, Peacey boldly claims that it has, nonetheless, been ‘inadequately conceptualised’. At one level then this work is a counter-blast to the preceding claims of revisionism. Alongside their insistence that printed sources could not provide access to historical truth, revisionists questioned earlier assumptions about the social depth and geographical reach of early modern political culture. The print itself, and the revolutionary politics it had been associated with, were both written out of their accounts of the mid-17th century. Certainly, as Peacey recognises, revisionism itself now occupies an increasingly marginalised position. Social historians, for instance, have demolished the notion of an apolitical (but silently conservative) ‘country’. Similarly, post-revisionists have demonstrated the importance of print in fostering ideologically-engaged publics. While acknowledging these advances, Peacey takes both groups to task. Social historians, he claims, have failed to connect local and national contexts and to properly integrate print into their accounts. Post-revisionists, for their part, have been unwilling to tackle the issue of reception, while concentrating on explicitly ‘public’ genres within print”. Peacey points to another area that needs to be studied, and that is Lilburne’s and the Levellers debt to the Dutch and their radical pamphleting culture. Lilburne drew a lot from the work of the Dutch. There is no small degree of controversy surrounding Lilburne’s conversion to Quakerism.The historian Christopher Hill believes that after the defeat of the Levellers many former Levellers joined the Quakers. Hessayon believes that although Lilburne may have changed movements, Lilburne was still Honest John Changing one shirt for another. Chapter 8 Reborn John? The eighteenth-century afterlife of John Lilburne. As Christopher Hill correctly observes ‘Each generation ... rescues a new area from what its predecessors arrogantly and snobbishly dismissed as 'the lunatic fringe”. The purpose of Ed’s chapter is to examine Lilburne’s political afterlife. He does a superb job. The fact that Lilburne and his work have endured down the centuries is not solely due to his personality or his undoubted courage and sacrifice. Vallance is clear not to personalise his struggle but attempts to place it in a more objective light. “there is a danger that in emphasising the separateness of historical epochs, historians have undervalued the degree of intellectual sympathy and continuity between the radicalism of the seventeenth century and that of the eighteenth. We do not need to invest in a grand narrative of an English ‘radical tradition’ to acknowledge that the English revolution of the seventeenth century had both intellectual and practical consequences for the eighteenth century. A life which ended in political retreat in Eltham in 1657 was resurrected in the 1700s to take up the ‘temporal sword’ once more. This collection will be of significant interest to academics, researchers, and readers with a general interest in the English Revolution and its radical political groups. Hopefully, with the book being published in paperback, at a reasonable price it will get the wide readership it deserves. As AL Morton said “A Party that held the centre of the stage for three of the most crucial years in our nation’s history, voiced the aspirations of the unprivileged masses, and was able to express with such force ideas that have been behind every great social advance since their time, cannot be regarded as wholly a failure or deserve to be wholly forgotten”. Blair Worden, ‘The Levellers and the Left’, pp. 316, 330. Mike Braddick, ‘The Celebrity Radical’, BBC History Magazine 8: 10, October 2007, pp. 34–6. Simon Morgan, ‘Celebrity: Academic “Pseudo-event” or a Useful Concept for Historians?’, Cultural and Social History 8: 1, 2011, pp. 95–114, at p. 98. The Historical Journal, vol 47 December 2004.